It actually took me a while to write a post about this, mainly because I never thought I’d ever write a thing about Justin Bieber. And also because I can barely stand the kid. But when I saw him taking some pointers from Floyd Mayweather about how to throw a few jabs, then I’m giving the kid the benefit of the doubt that he’s being more productive with his free time besides egging neighbors homes or nagging Selena Gomez. Check out the video Bieber barely breaking a sweat. The kid may be punching some gloves, but he needs to work a little more on that quickness. I’m even surprised his ego let him workout without one of his songs playing in the background. 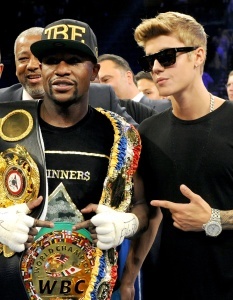 There’s still some questions as to why Bieber was in the ring in the first place. Maybe he needs some self defense moves to help fight off those 12-year-old groupies.